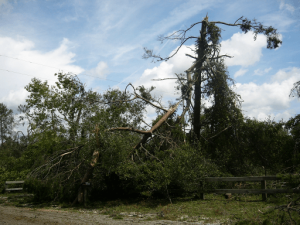 Trees felled by hurricanes cause tremendous damage. They bring down power lines, destroy property, and injure humans. Because of this, some people choose not to replace their downed trees. But this thinking can be misguided: we need trees now more than ever. How can we can have trees and still mitigate hurricane damage? By 1) choosing the right trees and 2) planting them in the right location. The right trees are easy to find. 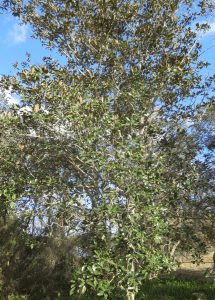 A study done by the University of Florida in 2007 identified several high-wind-resistant trees. These include live oak, American holly, southern magnolia, bald cypress, and cabbage palm and others. These are all large trees, not suitable for every yard. Smaller wind-resistant trees include yaupon holly, fringe tree, and crape myrtle among many others. The UF study is found online (www.edis.ifas.ufl.edu/pdffiles/FR/FR17400.pdf); skip to the last three pages for a good summary. The right location means recognizing the conditions of your yard and choosing a tree accordingly. Is your property sunny or shaded? Dry or soggy? The right location also means placing potentially large trees away from buildings, driveways, and utilities. Planting a live oak sapling right next to your home or under a power line is begging for future havoc. 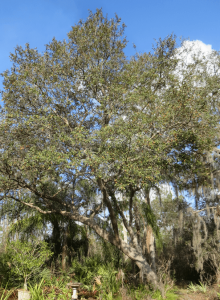 To help you choose and plant Florida-friendly trees, a great resource is the UF gardening website www.gardeningsolutions.ifas.ufl.edu. Be advised that no tree is 100% hurricane-proof but by planting the right tree in the right place you will not only lesson your risk of injury, you will add value to your property and improve your planet. So plant a hurricane-resistant tree today! Duryea, Mary, and Eliana Kampf. ← THE DISTRICT VIII 4-H CITRUS TREE PROJECT – HOW SWEET IT IS! Master Gardener, UF/IFAS Volusia County MasterGardener@volusia. org (386)822-5778.